Today on the 12 pm trip on the Aurora, we headed out to the middle of Stellwagen Bank. We had a gorgeous day out on the water, and even though we were more than 20 miles offshore, we still had a great view of the Boston skyline. Vemon’s fluke, which is actually missing a chunk on the right side. We found three humpbacks all in the same area. They were changing direction a lot and taking rather long dives at about 8-12 minutes. We got some great looks at Satula to start the day off. 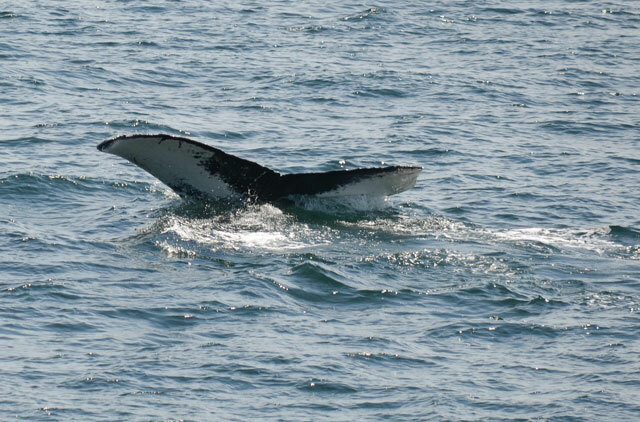 We then moved on to Venom, who is a female that was born in 1996, who actually did a breach a long ways away from us. We then found Shuffleboard who gave us some great looks at its tail. Lastly, we ended on Venom who popped up and showed us her beautiful tail. Overall, it was a wonderful day out on the water and a good trip.